"My parents have always been opposed to buying a TV and they were trying to explain to us the reasons why they were not falling in line with the TV-buying public. We couldn’t understand all their arguments until they finally put it to us this way: TV is for those who will never get to experience the real thing. Do you want to actually visit, some day, all those beautiful places they show on TV, or would you rather be happy with just seeing them on the screen? The choice simply put was: Buy a TV, or travel around instead. We chose travel. And I am proud to say that till today we have never allowed the idiot box space in our house. We have travelled instead to almost all parts of India. I learnt snake catching in Pune, handled crocodiles in Mamallapuram, studied spiders and earthworms in Chennai and even travelled to Thailand and Malaysia in my quest to learn more about reptiles. All of which I managed to do because I never sat in front of a TV." Read the full article by Rahul Alvares, a young snake rescuer from Goa, who has recently won the ’Young Naturalist Award’ given from Sanctuary Magazine by clicking here. many of his colleagues asking for deflected sunlight in their rooms, too. So, today he’s a busy man, organising mirrors for everyone. 10 more offices," he says. white, and not-so-smooth, this light is dispersed to the rest of the room,"
brings no heat with it." In February, 2007 scientists from around the world kicked off the Amphibian Ark project, a global campaign to protect the world’s vanishing amphibian species from a ravenous killer fungus, widespread habitat loss and exposure to pollution and global warming. Project organizers are asking zoos, botanical gardens and aquariums around the world to each take in at least 500 frogs from a threatened local species to protect them from the killer fungus, chytrid. text optimally. And thus saves paper. Such software need not necessarily reside in computers. They could be embedded into other systems too. Sell the Tiger to Save it? Selling the Tiger to Save it? "Enforcement of wildlife laws in China is lax, one of the main reasons that smuggling is so rampant and this laxity will extend to the tiger farms rendering any system of monitoring ineffetive. In the event of the lifting of the ban on trading in tiger parts, laundering of wild animals through legal channels will thus be the more than likely outcome." Dr. Xu Hongfa, China Director of TRAFFIC agreed with Indian wildlife experts that farmed tigers will always be more expensive than poached ones, doing little to dampen the profitability of poaching. What the Chinese government really needs to be focussing on is habitat conservation, Dr.u says. He blames the dramatic depletion of China’s tigers on an equally dramatic loss of habitat for the animals as a result of deforestation and expansion of large- scale agriculture. Until some of its natural environment is brought back, no amount of breeding will save the wild tiger, he concludes. “In India, as in China, stimulating an interest in nature is a task of the utmost and immediate importance. With both economies growing at rates of around ten percent a year, whole ecosystems risk being destroyed. In India the most recent example is the famed bird reserve of Bharatpur. The increased demand for water in Rajasthan has lead to the diversion of the water supply from Bharatpur, the winter home of 70,000 migatory birds, or rather what was the winter home of 70,000. Since the local river was re-channeled the birds don’t come anymore…. In Britain surveys have found that 85% of respondents have stated that they learn most about their environment from television. Patently India is not necessarily a direct parallel, however there is no doubt that television could have a positive role to play in creating awareness among India’s 1.1 billion people. A sizeable proportion of the population do not have access to television, but hundreds of millions do. It is vital then that a strong and vibrant natural history industry evolves to supply this huge market with home grown films to reinforce the sense of wonder and respect for nature that needs to be there, so it can be defended…..
A Computer costing less than Rs 5000/-? When one talks about E-governance for conservation, most of us dismiss the idea as one whose time has not come. Rajesh Jain, co-founder of Novatium says that in India’s PC market there are 10 million relatively wealthy Indians at the "top of the pyramid" who buy computers just like consumers in developed countries. There are an additional 30 million urban Indians at the "middle of the pyramid" and 100 million very poor Indians at the "bottom of the pyramid." "What we are saying is how can you dramatically bring down the entry levels for computing in this country and make it accessible to the middle of the pyramid?" he says. Novatium’s approach has been to completely redesign the computer, slashing costs while keeping the form and functions typical of a top-end PC. Once it’s set up, it doesn’t look all that different from a conventional PC—the basic box plus a keyboard and monitor. It installs and operates as simply as a television—you plug it in and switch it on. And the money doesn’t come from government budgets or philanthropic largesse, but from Jain’s profit-oriented business model. The concept owner and cofounder Prof. Jhunjhunwala and researchers at IIT came up with a plan that builds on the "thin client" concept that has been popular in the West for years, but only for business applications. It uses a cheap microprocessor and removes the hard disk, CD/DVD drive and other costly and problem-prone components, leaving the keyboard, screen and USB port. Easier to maintain than regular PCs, sales of thin-client PCs to businesses are growing at about 20 percent a year in developed nations, even as sales of regular PCs flatten. Instead of working backward from the PC, Jhunjhunwala pioneered a new architecture from the ground up, replacing the expensive microprocessor with the guts of a mobile phone—thus tapping a supercompetitive industry with enormous economies of scale. In 2003, Jain and Jhunjhunwala cofounded Novatium, along with Analog Devices Chairman Ray Stata, with the aim of taking thin-client computers into the home market. Documentary film making in India has always been a challenging task. Commissioned projects end up in the can after being screened to a select audience. The public do not get a chance to see them as the screening opportunities are limited. But “Vikalp” in Mumbai and traveling film festivals of Centre for Media Studies, New Delhi, and “film vans” in Kerala and Bengal are changing all that. If you are an independent producer who spend hard earned money in making films one finds the investment does not come back and making more films remains a dream. But there is hope here too. Production costs and Camera costs are coming down for one. Outlets for distribution like youtube.com and google videos offer a free platform to reach your videos to a wider audience. Video CDs and DVDs are a possible distribution method too. Just like Maharashtra has a national park right next to its capital Mumbai, Jammu and Kashmir has a national park within Srinagar, just a couple of km from the heart of Srinagar. 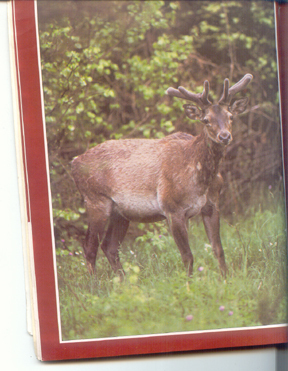 Dachigam is famous for protecting the last few numbers of Hangul deer in the wild. 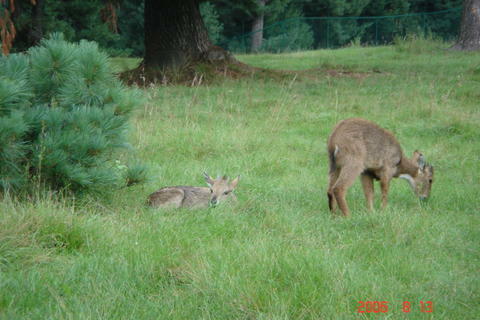 Seeing a wild hangul was on top of my list when I visited Srinagar in August 2006. August 15, Independence Day, was just a day away. The Indian Army was out patrolling, with an armed gunman at almost every 100 meters or so. Going to Dachigam meant organizing passes and special permissions, which the owner of the houseboat we stayed in gracefully organized. So we set off to see hangul and black bear both of which are famous residents of the Park. Just as we entered the park we saw a group of grey langurs, again endemic to this forest jumping about in the trees. On closer look these langurs did look different from the langurs we see in Delhi; much bigger and indeed, grey. I was happy that no one including the forest guard and the army person who accompanied us objected to my using the video camera. Next stop was an enclosure where the forest officials had rescued a baby black bear whose mother had been killed (probably by angry villagers whose crops the bear raid often). This small fellow was trying eat rotis and drink milk provided in a pan. I could have taken a photo but did not. Somehow the idea of photographing a deprived baby black bear in a cage right inside a national park did not appeal to me. (My camera bag refused to open for the leopards caged inside the Sanjay Gandhi National Park, Mumbai too). Suddenly we were told to keep away all cameras as we were entering a high security zone- permission to enter this area was difficult to obtain-Mr. Chapri our host informed us. Our group consisted of my husband, son and a French couple. ALL OF US WERE CURIOUS-MAY BE WE ARE GOING TO SEE THE PROTECTED HANGUL FINALLY! Our ‘Qualis’ entered a huge gate to reveal a beautifully maintained villa and park-the winter residence of the erstwhile Prime Ministers of India. We were told this was the private house to which Indira Gandhi retreated when she wanted privacy. The outside of the building was paneled with oak tree logs. The garden had huge trees. 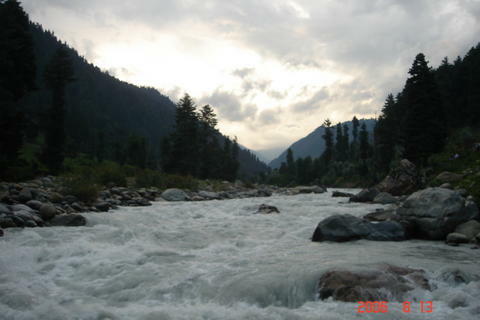 A very peaceful place –right inside the Dachigam National Park! What about the hanguls we asked. The forest guard replied that one has to climb up to much higher altitudes to see them and all those areas are now out of bounds thanks to militancy. He assured us that in higher altitudes there were black bears and Himalayan Monals in plenty- but the area is infested with militants and none is allowed to go trekking. I had seen a documentary on the demilitarized zone of South and North Korea. 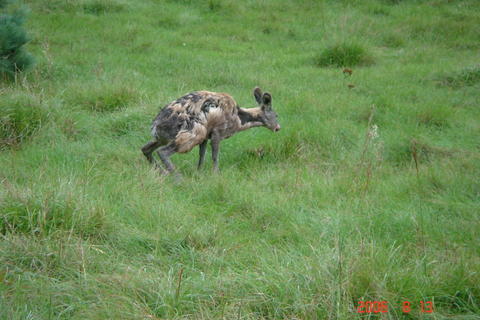 The film showed how the DMZ protected highly endangered deer and antelope population of those areas thanks to heavy patrolling and some awareness among the army personnel who helped feeding these animals in periods of extreme weather conditions. May be a similar miracle is happening in Dachigam too- or is that being too optimistic? Our forest guard companion was very happy to talk about his experiences. He was a dedicated man –dedicated to saving the black bear in particular. 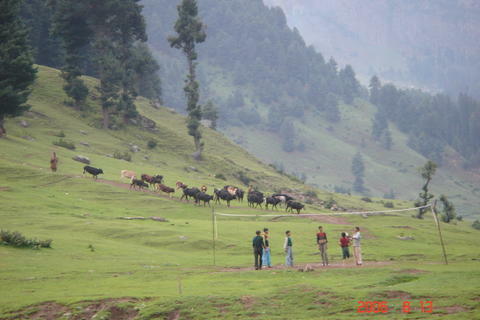 He passionately believed that the Dachigam forest will survive only if the bear population is healthy and thriving. The forest belonged to them and then only to man he told us. We did see glimpses of gurgling streams inside. The air and water inside is pure and one will never get ill if you stay inside the forest, another Kashmiri who was working with the rainbow trout project explained. Our next stop was the rainbow trout center. Here the trout are bred scientifically and the produce sold outside at reasonable prices-one person is allowed to buy only 2 kilos in a day. The scheme is so popular, that all the produce is sold out in a couple of hours. The trout center was well maintained. I had never seen such large trouts before. Gulmarg has a trout centre where tourists can buy coupons for fishing - again in a rationed manner- one coupon entitles you to four catches. But the rainbow trouts there were not so big. Suddenly we were told our time inside the Park was up. We had seen all that was allowed to be seen by tourists. I asked for some pamphlets on the Park. Our forest guard friend gave a moth eaten book produced by Sanctuary magazine for the Department of Wildlife Protection, J&K Government. It had obviously been written at a time when the Park had seen better days. I thanked him and as was happening all too often during our trip to Kashmir, my eyes filled up, this time for the beautiful animals in a beautiful park. I could not but admire the pride and faith of the forest guard who reaffirmed my own faith that you can never subdue nature. In that sense our visit to Dachigam had a silver lining.